My very last xmas present is finished! I used my own koolaid handpainted yarn--knitpicks color your own merino. i used 12 packets each of blue raspberry, apple green, and grape. the grape melded with the other colors, but i think it worked out for the best. the socks don't noticeably pool. the pattern is the jaywalker socks from magknits. the pattern shows off the handdyed yarn very well. i would probably make another pair of these socks, after i've had time to forget about what a pain they were to knit. i don't blame the pattern--i just had brainpower shortages or something and kept screwing up for no reason. i modified the pattern slightly. i made 8" cuffs and started with the largest size, decreasing to the smaller size at 5". this is the first pair of top-down socks i've made in a very long time. i just washed and dried these socks in the machine. it wasn't too tragic, but i would recommend hanging to dry from now on. these socks are for my sister in law. it's very lucky for her that they are too big for my feet, or else i would keep them. i can't wait to dye some more yarn, but first i should try really hard to use at least half of the sock yarn i already have. i also decided i would give her the hermione hat. i can always make myself another one. my roommate's mother made them for us a few years ago. 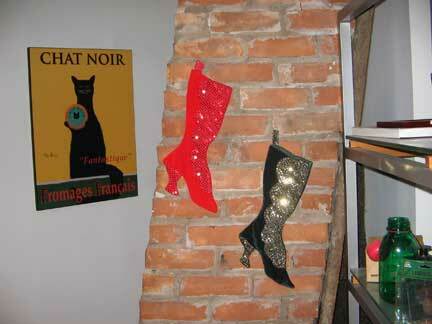 we hung them on our psudo-chimney with care. amazing dye job - and great sox! Those came out fantastic! I love the colors! I've updated the gallery to include them :).